Well known Sanpedrano Gerald Leslie is has been living in the USA, working as pilot for the world famous songwriter and singer Jimmy Buffett. It is no surprise that both men share a love for the sea and fishing. During their spare time, the two often go out to sea and practice their fishing skills. 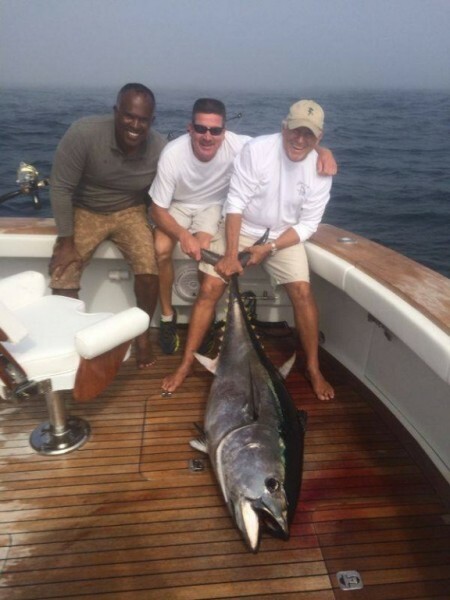 On one of their days off last week, Leslie, Buffett and another friend went fishing off the coast of Nantucket, Massachusetts. During their day’s adventure, the trio caught a huge deep-sea black tuna. Buffett and Leslie are excited to share the picture with the people of San Pedro Town. Like Leslie, Buffett is also no stranger to the island. He has played an important role in the education sector of the island through helping the San Pedro High School. He has been coming to San Pedro for almost 35 years and considers Ambergris Caye his second home. Congratulations on the big catch and we hope to see you guys in San Pedro soon!